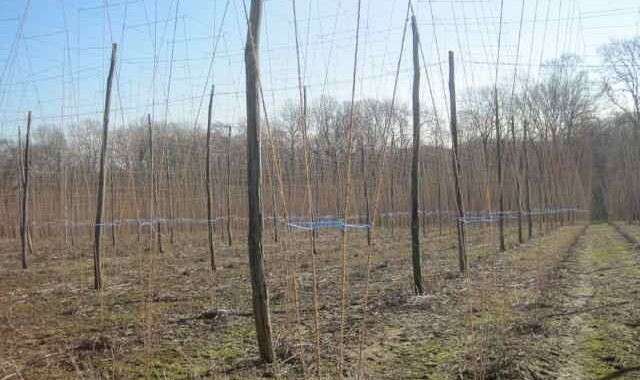 The first job of the hop growing year is hop stringing and banding-in, it is the true beginning of the growing season. Winter is usually when any wire-working renewal or repairs are conducted, but stringing which starts in late winter or very early spring in this area is one job that is nice to get done, dusted and out of the way before the weather warms and the main season for farm work starts. It is a job where heavy tractors aren’t needed on the land, hence it is perfect for when the ground is soft as only man power is required. 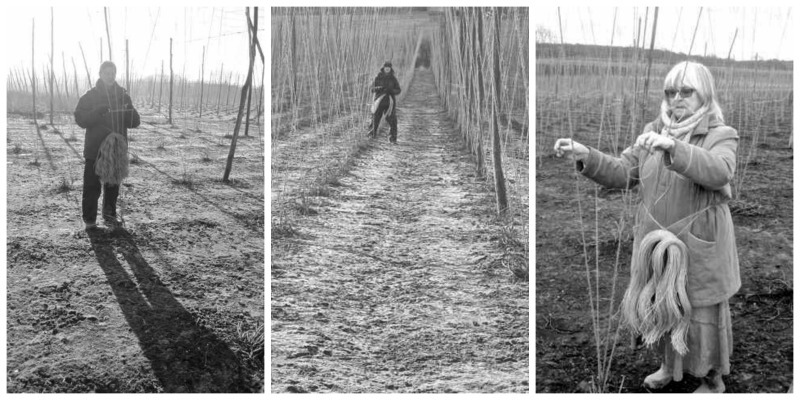 Stringing the hops is normally man’s work which goes hand in hand with banding-in which is generally ladies work. This is not for any chauvinistic reasons, it is just that it makes sense that as the men are stringing we ladies can do the banding-in. That way the job gets done efficiently and after all, we are all working towards the same end. It seems it has always been thus! Have a look at the Pathe news clip of stringing and banding-in competition, it is a joy to watch but our men do not move as fast as this! This early season here has more a relaxed, less urgent air. In fact the whole Pathe news clip series is a wonderful archive of days past. 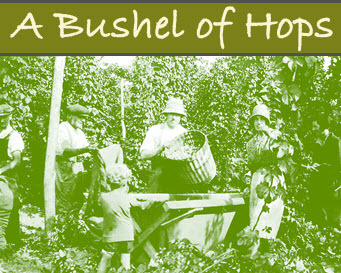 It is interesting that not much has changed in the growing of hops other that the amount of folk that were needed to get the crop hand picked at harvest back then. Thank you to the Pathe team for permission to allow me to include their links in my posts. 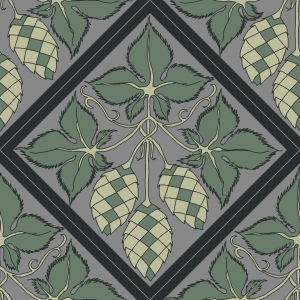 There are several different patterns for stringing and not all of the patterns require banding-in. The reason that it is necessary for the more upright ‘umbrella work’ style of stringing is simply to hold the strings back to stop them falling into the centre of the alleys. By banding-in the 4 strings on each hop hill, this forms a tunnel for a tractor to drive down each hop alley once the hops are full grown and more especially when they are heavy and wet. Banding-in is an easy job, it’s not physically demanding and with a happy companion and a few shared interests to discuss, the days out-of-doors slip past pleasantly. Hands fly on automatic pilot – 1 half hitch, 3 alternating twists and a reef knot, move onto the next hill and repeat, it is a job that allows for easy conversation as you go along. If you are on your own, wildlife seem unconcerned by a solitary figure moving slowly through the strings, you can then daydream or think, it’s repetitive nature is meditative. If bored with your own company you can always listen to a personal radio of course! Those are the pleasant things about banding-in and as with most seasonal jobs on a farm while it may not need much brain power, or work which you may not like, but you can take heart in that it will not last for very long. Extra layers of clothing can be discarded if the sun comes out, but if it gets colder the layers of clothing rapidly go back on and at times we can end up resembling extras from a scene in a film set in deepest coldest Siberia. Downside, well like all jobs it certainly has one and this one is chilly finger tips. Everything else can be covered with layers and you can keep warm, but if the strings are wet with dew or rain and especially on breezy days, finger tips quickly become painfully cold. Frosty strings in the morning are worse! Brr cups of hot drink are needed more for warming hands than for quenching thirst, but so far this year it has been a good one for toasty fingers. 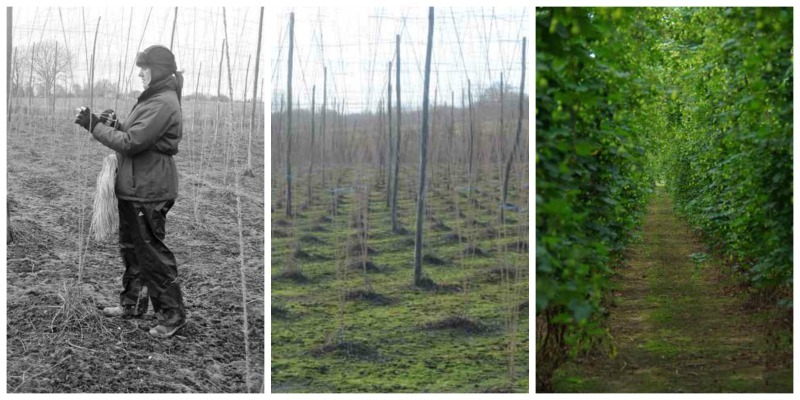 It may seem like a ‘nothing much’ job but as with everything to do with growing hops every little insignificant piece is part of the larger jigsaw and the majority of it is hand work. There is something in nothing if you allow yourself to be interested and see the point of the end result. 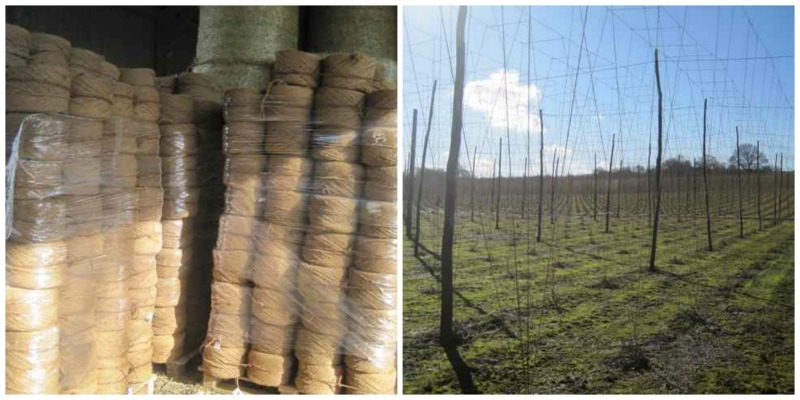 The string used in hop gardens is coconut fibre made from the outer husks of coconuts, it is collected and spun in Sri Lanka It is hairy and coarse making it perfect for the bines to climb up in their rapid assent to the top of the wire-work. 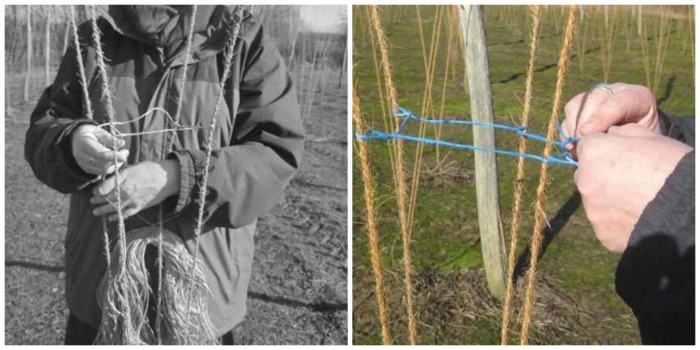 When banding-in we love to spot the occasional bright coloured threads caught in the twine. 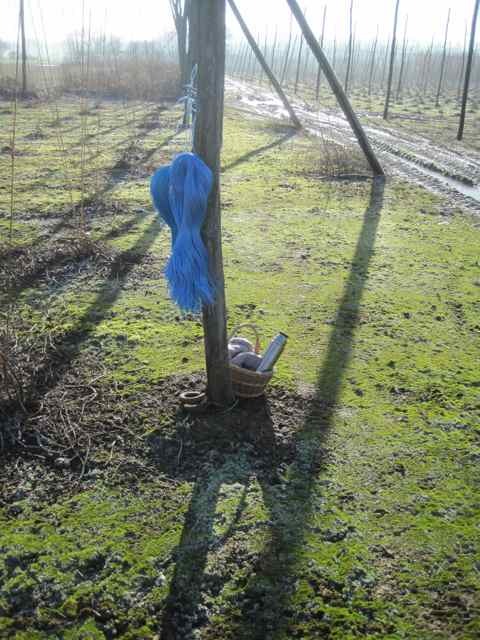 whilst we are working outdoors in the soft muted palette of an English countryside in winter, the bright primary colours of these threads look incongruous in this setting. These threads allude to women in their colourful saris spinning this twine in warmer Sri Lanka. It is nice to feel that connection, we are all doing a simple job but each is an essential part of the bigger picture. 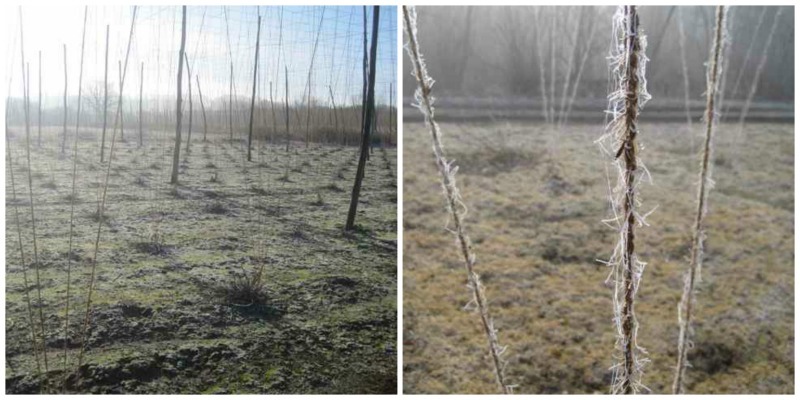 That is what makes the hop growing so interesting, it’s rewarding that however insignificant your job seems, you know you are a small link in the larger chain of the hop growing year.